Why doesn’t PortVision DX (Comtrol’s management software) see my DeviceMaster? The most common reason is that a firewall or router is not configured to allow use of the port (or socket) numbers needed. To get from the PC with the DeviceMaster driver or PortVision DX, to the DeviceMaster itself when firewalls or routers separate the two units you will have to open some sockets on the firewall or routers and allow or ‘forward’ packets in both directions. At a minimum, you will want ports 4606 and 4607 opened. In most cases you will already have ports 80 for http (web browsers) and port 23 for telnet open. 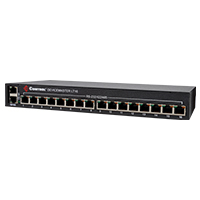 If not, I would recommend that these ports also be configured in the firewalls, and or, routers. Once the 2 minimum ports are configured, PortVision DX and the driver will be able to communicate with the DeviceMaster and all will be well. For instructions on opening these ports, in either Microsoft’s firewall or Symantec’s firewall, contact our support team at 763.957.6000.